Powers/Abilities: The Many-Legged One was a spider as big as two men. It was very strong, capable of lifting 100 kg very easily, but was not very agile or quick. It was furry and had red-crimson eyes. It ate meat, but left the bones behind. Its jaws were poisonous. (Conan the Barbarian I#101 (fb) - BTS) - The Many-Legged One was imprisoned in a big hole in the ground in the midst of the Bamulas' village. The Bamulas kept it fed him with the enemies captured during their wars in a rite which invoked their god Ekku. 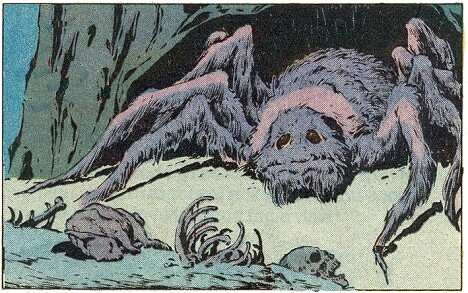 In those occasions, the great spider would crawl out from its cave and eat the victim. (Conan the Barbarian I#101 - BTS) - One night, a captive of the Katumi tribe was thrown into the pit and the giant spider soon killed him. 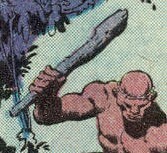 (Conan the Barbarian I#101) - Several nights later, during the full moon, the wooden cage that covered the pit was removed and a brush-hare was tossed in. The spider smelled the blood and went out of its lair. Soon after, two men began fighting above it, walking on a huge log which crossed the pit. The fighters were Conan and Yorubo, the would-be chief of the Bamulas. The Many-Legged One felt other warm-bloods near him, and tried to jump up to reach them, but it could not. However, Yorubo then fell onto its back and he was soon followed by his wife, Felida. The venomous arachnid began attacking them when a stinging pain in the back hurt it. The second man, Conan, had wounded it with a spear. The Many-Legged One then attacked Conan but, again, a spear was stabbed in its mouth, hitting the brain. 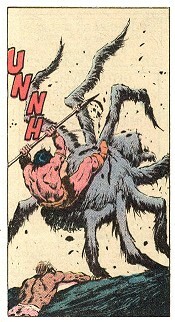 The spider struggled for a short while, but the strong Conan held the spear until its death. No webs were seen in the pit, so perhaps the spider didn't produce it? The relation between Ekku and the Many-Legged One was not mentioned. The Bamulas chanted Ekku's name while sacrificing men, throwing them to the Many-Legged One. or any other giant spider. Ekku was the Kushite god of fortune and was said to be two-faced. The Bamulas often invoked Ekku's name. He was also known as N'Yaga. He seemed to be a bloodthirsty god because the Bamulas sacrificed men in his name, letting them die at the jaws of the Many-Legged One. Mulla was a warrior who wanted to become chief of the Bamulas. He opposed Yorubo's actions, always seeking to command the tribe and be the will of the Bamulas. When the council gathered under the new moon, he was killed by Yorubo while quarreling about what to do with Conan. Shangu was a Bamula warrior and was among those who captured Conan. Two of them held the Cimmerian while he knocked him out using a club. Yorubo was a strong and bold warrior of the Bamulas and had a wife called Felida. He used a spear as did many other Bamula warriors. When the chief of the Bamulas was killed by Conan, Yorubo tried to claim the leadership of the tribe, but Mulla opposed him. Days later, when Mulla wanted to dispose of the prisoner Conan, Yorubo stopped him and killed him in cold blood. His act made the other warriors hesitate, so, when Conan asked, in the name of Ekku, the right to fight for the war-chief's spear, they declared the fight to be between Yorubo and Conan. The two dueled with spears, walking on a log placed above the pit of the Many-Legged One. After a short but almost even fight, Yorubo was thrown in the pit. His wife quickly jumped in after him to help her husband against the furry monster. Conan also jumped onto the monster, stabbing its back. But he had to thrust the spear into the spider's head to kill him. Yorubo, still wary, assaulted Conan again, but was killed.